Peripheral neuropathy affects nerves outside of the brain and spinal cord. Dysfunction of these nerves can cause spontaneous, inappropriate signals or loss of signals, leading to symptoms such as pain and numbness. This condition affects more than half of all diabetic adults, approximately 500,000 chemotherapy-treated patients, and an estimated one million individuals with an inherited degenerative nerve condition called Charcot–Marie–Tooth disease type 2 (CMT2). Peripheral neuropathy can cause severe disability and increases the risk of limb amputation, which significantly diminishes quality of life, but currently there is no approved treatment. Regenacy Pharmaceuticals is developing a novel, disease-modifying approach to treating peripheral neuropathies that goes beyond pain and symptom management to restore peripheral nerve function. The company’s lead compound ricolinostat is an oral, selec- tive inhibitor of the microtubule-modifying enzyme histone deacetylase 6 (HDAC6). With first-in-class potential, ricolinostat is currently positioned to enter a phase 2 clinical trial for diabetic neuropathic pain. Neurons conducting signals to and from the spinal cord into the feet and hands are the longest cells in the body. These neurons rely on an internal micro- tubule transport network to supply energy and nutrients to maintain nerve ends in the skin and muscles. When this transport is disrupted by disease nerve cells can malfunction and send random signals, resulting in pain, tingling, muscle spasms, or no signal at all, leading to numbness or paralysis. These are the symptoms of peripheral neuropathy that can result from diabetes, chemotherapy, and mutations. Intracellular transport is regulated by HDAC6—a microtubule-associated deacetylase that plays a significant role in axonal functioning in the nervous system. 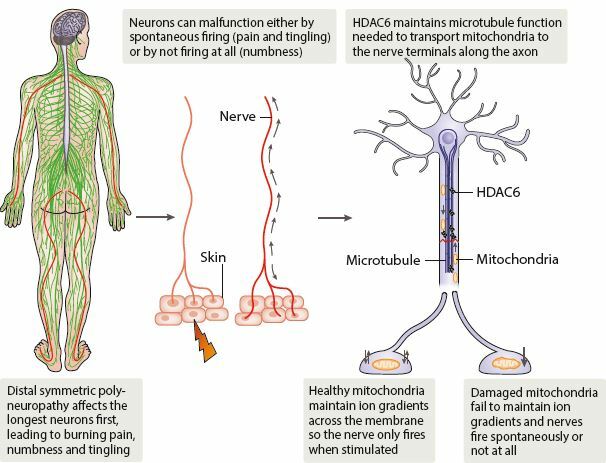 Inhibition of HDAC6 is a novel approach to restoring nerve function for the treatment of peripheral neuropathies by re-establishing the transport function of microtubules (Fig. 1). Phase 1 and 2 clinical trials in 250 cancer patients’ demonstrated ricolinostat’s excellent safety and tolerability profile, particularly when contrasted with the high toxicity of currently marketed, nonspecific pan-HDAC inhibitors such as vorinostat and panobinostat. Fig. 1 | Mitochondrial transport by histone deacetylase 6 (HDAC6). HDAC6 is a key regulator of fast axonal transport, which is impaired in distal symmetric polyneuropathy. The slowing of transport in the longest nerves leads to dysfunction of the nerve terminals, causing pain symptoms, numbness and tingling. These appear in a‘stocking and glove’ pattern in patients with diabetes, inherited neuropathy or in patients undergoing chemotherapy. Currently, Regenacy is seeking additional partner- ships to develop its portfolio of HDAC inhibitors. Recently, the company announced a collaboration with the Charcot–Marie–Tooth Association, a non- profit organization serving the hereditary neuropathy patient community, to validate the role of HDAC6 in multiple forms of CMT2 and evaluate the efficacy of ricolinostat in animal models to support the initiation of clinical trials.